We encountered an original Elka Synthex when we paid a visit to Ulrich Schnauss's studio in 2014. NAMM 2015: Generalmusic, the keyboard and pro audio manufacturer that's responsible for the Gem, Lem and Elka synth brands, has announced that it's returning with new products this year. A holding page on the Generalmusic website states: "It is our 125th anniversary and we will bring to market some legendary re-issue models and brand new technology. "Generalmusic will offer unbelievable Italian sound together with superior technical quality - made in Finland." 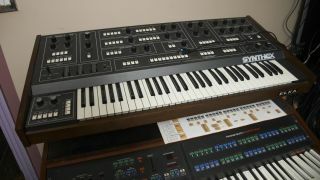 Many will hope that this might mean that we're set to see a revival of the Elka Synthex, the 8-voice analogue synth that was popular in the early '80s. With any luck, we'll find out more at the NAMM show the week after next.